Feeling proud today. 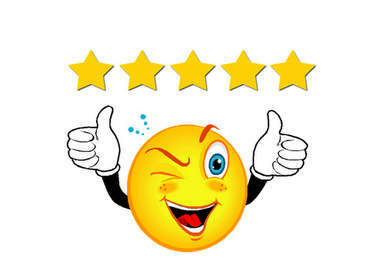 I’ve got twelve reviews of my book on Amazon and this site. These words are so meaningful. Those who have read it range from family and friends to acquaintances and those I’ve never met. This outcome is astounding and I am beaming with pride! Thank you! A wonderfully woven tale of friendship, discovery and a journey towards motherhood. A great read for all but particularly if you find yourself at a crossroad of spirituality, growth and the human experience. 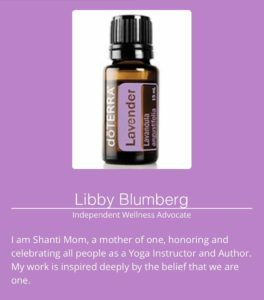 Libby allows us in as she discovers the spiritual connections around her. I loved this book! It’s a quick read but packed with marvelous observations about friendship, becoming a mother and learning about life. 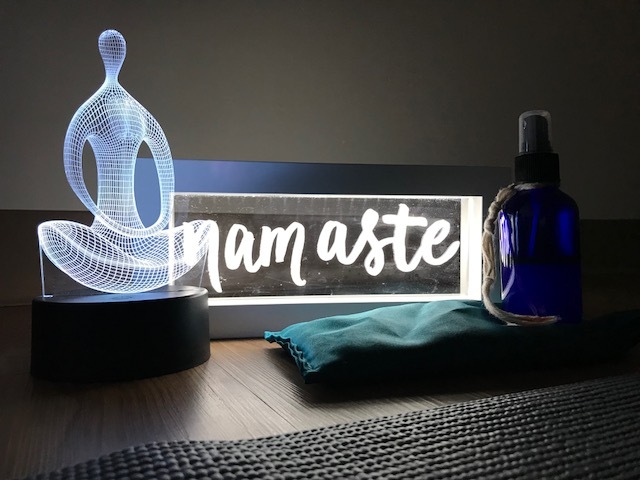 Makes me want to try yoga. Wow! 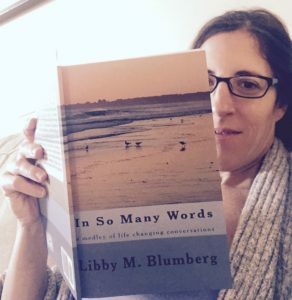 Libby M. Blumberg’s, In So Many Words—a medley of life changing conversations, was nothing but inspirational. The conversations and stories that Libby shares, with her audience, are truly eye opening and encourage you to think of your own life’s journey. This original piece of literature, allows the reader to spiritually and emotionally analyze their own personal feelings by making connections and reassuring yourself that there is a bright and positive side to situations in our lives. In So Many Words, is uplifting, inspiring, and provides a sense of hope. 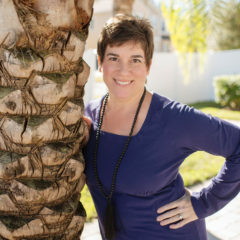 Libby M. Blumberg, not only shares her honest life stories, but most importantly how she overcame uncertainties in her life through spiritual awareness, yoga, and her lifelong friendships-which is genuinely admirable. I personally cannot wait to read, She Waited for Me, Libby’s next book. In So Many Words: a medley of life changing conversations is truly a worth while read. Libby M. Blumberg tells her story as closely to having a conversation face to face as a reader can get. It is refreshing and inspiring and full of feeling. This book, without a doubt, is so applicable to so very many. I am confident that readers from all walks of life can find something to relate to, some meaning to take away or have an “I really needed to hear” that moment during the course of this well written, down to earth book! Happy reading! Libby Blumberg has written a gem of a book, collecting and preserving some of those impactful conversations that enter our lives at just the right moment. “In So Many Words” will be valuable to anyone in the process of setting a new course in life, or mustering the courage to make a course correction. * Jason is a fellow author and illustrator. Check him out. Rarely do you find a book that speaks to your soul as a mother, a woman, and a seeker of self-awareness. “In So Many Words” is a honest reflection of life from the perspective of another mother and woman who asks the eternal question, “Why?” I found this book easy and enjoyable to read. Honestly, it flowed much like a conversation with an old friend. Thank you for being so courageous and willing to share your journey with us. It was amazing to read her passion for life through the good times and bad. I’m interested to read the next book! Libby’s story is one of courage, deep faith and trust in the value of human relationships. She has a gift for introspection, acceptance and an open heart. She inspires the reader to take that “leap of faith” with confidence and trust. I look forward to reading Libby’s second book, “She Waited For Me”. Thank you Libby for sharing your heart with us. I love how as a young woman that were open to learning from women that were older. It is my belief that we are all here to share our wisdom and love with one another unconditionally. Your story is heart warming and I look forward to your next book. Such an interesting story. So glad this group met to help this beautiful woman. Libby leaves us wanting more from her next book!! If you’ve ever had good friends (and you know you have) you will enjoy this book. Thanks to Libby Marsh Blumberg for writing it all down…. In So Many Words: a medley of life changing conversations is truly a worth while read. Libby M. Blumberg tells her story as closely to having a conversation face to face as a reader can get. It is refreshing and inspiring and full of feeling. This book, without a doubt, is so applicable to so very many. I am confident that readers from all walks of life can find something to relate to, some meaning to take away or have an “I really needed to hear” that moment during the course of this well written, down to earth book! Happy reading! * Jessica is a fellow Fundanoodle Ambassador. Check her out. Previous Previous post: “Oddball” DVD Review and Giveaway! Next Next post: CD Giveaway on Blog Mom Reviews!